I'm going to have to make a FusionFall Wiki account and add some missing photos. For example, the Cheosuk Skirt has no picture on the wiki. It's a good thing I made my legendary grinding results video. It has a picture of it, AND I get to add in further items for the uncommons and rares that have no info on them. I'm done with today's editing. - Added the locations of all items from level 29 to 36. I wasn't able to do it for anything below that because there are multiple areas for each level. For example, level 3 has Peach Creek Commons, Estates, and Candy Cove. - I added the monster's type for any monsters I skipped over. I wasn't able to continue the grinding results because of errands, unfortunately, however, I see no reason to not be able to do it today. I made the FusionFall Wiki account and uploaded the photo. I also updated the out-of-date information with these two items not being on Retro which is false. I'm focusing my attention towards editing this video I'm making. I should be able to update the guide, even a little bit, today. Excuse me if my question isn't adapted to the topic, but where can we get items under level 5 ? I'm looking for some of them that are listed as level 1 or such. The list is very well done, by the way. Items under level five are primarily found in the future. The only way to get those and ones from events is through trading. So, you have all the locations added of all the rares and all the uncommons through lvl 29 to 36? Was going to add all the lvl 29 to 36 items locations eventually. But, I guessed you beat me to it. I only have a limited list of items I picked up while grinding lvls 18-22ish, mainly uncommons, but I've been wondering just how "Uncommon" they are. Is it generally a whole area that drops things, or are the uncommons specific to a certain enemy like URs etc? Just wanted to say on behalf of all people that like to collect in-game items (not just ultra rares and rares), thanks for making this! Having droplists of all items in one place is super convenient. Glasgow Pants and Lowlander Pants are also dropped by Tar Titan. As I was building the guide, I felt burnout and stopped editing for a few days and focused on editing the grinding results video. Some other stuff happened which delayed both projects; however, I should be able to edit the universal item guide again. Each monster has their own drop table. It's the same for commons and uncomons. Thanks! It's a work of love. Thanks. I'll add it in. Okay, I placed in 4 hours into this guide and for the official FusionFall wiki. I updated the guide a little bit. From my recent legendary grinding results, I added information on the drop table of Ghastly Growths. Also, a friend of mine, Illest Mexican, gave me information on the Jurassic Centurion drop table by giving a list of all of their uncommons. Note couldn’t have access to the document. So wrote down a very long list. Also, the words that are crossed means they happened to be confirmed already. I happen to ‘double confirm’ it. I can confirm the girl items since my friend Sky Runner who plays a girl character grinded them with me and can confirm as well. -Shark Bite (rare), from lvl 13 Dynamite Mouse at City Point. -Zac Skate Pants (rare) drop from lvl 13 Dynamite Mouse at City Point. -Kickflip Shirt (rare) also drop from lvl 13 Destroy-us-alls at City Point. Another drop location. -Vanquisher Shuttergun & Kickflip Pants (rare) drop from lvl 14 Ghastly Growths near Mount Blackhead. -Kickflip Pants (rare) drop from lvl 14 Clawdads at Leaky Lake. -Nosegrind Shirt (rare) also drop from lvl 16 Terropins at Acorn Flats. Another drop location. -Nosegrind shoes (rare) drop from lvl 17 Dynamite Mouse at Pimpleback Mountains. -Needlenose rifle (rare) drop from lvl 17 Wild Skeeters at Pimpleback Mountains. -Frappe, Admiral Shirt, and Dark Avenger pants (rare) drop from lvl 17 Boardwalk Bullies at Orchid Bay. -Tailslide shirt (rare) also drop from lvl 19 Riot Rogues behind Morbucks Towers. Another drop location. -Guppy Triceraquin Gun (rare) drop from lvl 20 Timber Hulks at the Ruins. -Commissioner Shirt (rare) drop from the lvl 20 Timber Hulks at the Ruins. -Pinknose Rifle, Windswept Shoes & Tech Saboteur Shoes (rare) drop from lvl 21 Timber Creepers at Tech Square. -Magnetic Spreader (rare) drops from lvl 21 Canyon Stalkers from in Devil’s Bluff. -Watermelon Frappe (rare) drop from lvl 21 Talon Titans at Devil’s Canyon. -Grand Marshal shoes (rare) drop from lvl 21 Horror Kings near the the Tyrannical Gardens IZ at Galaxy Gardens. 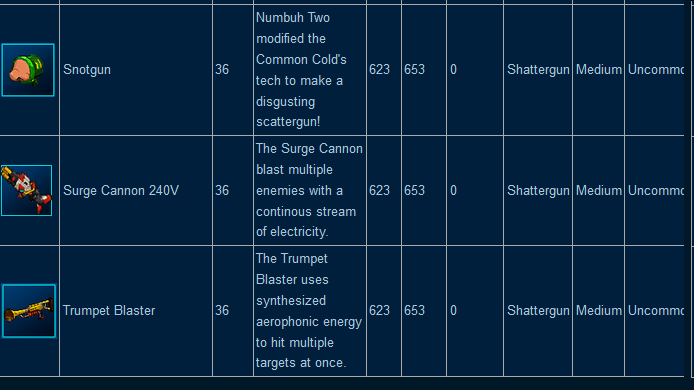 -Emerald Angel Shoes, Spearnose Rifle & Sugar-Free Gumzooka (rare) drop from lvl 23 Putrid Spawns at Steam Alley. -Fruit Gumzooka, Omni-Range Pitch Pistol & Eagle Headdress (rare) drop from lvl 25 Fowl Fiends in the Lower Catacombs. -Super Smooth Shaverama, Gold Angel Shoes, Tech Flight Shirt & Tabasco Flamethrower (rare) drop from lvl 26 Cryptworm at the Lower Catacombs. -Whitelight gun Tech Flight Pants, Hardnose Rifle & Rapid Fire Boots (rare) drop from lvl 26 Brackish Beasts in the Really Twisted Forest. Elysian Spreader (rare) drops from lvl 31 Fusionflies at Hero’s Crest. -Short Circuit Shoes, Cheops Leggings, Super Scope Centaur, Gaelic Pants & Brass Apple of Discord (rare) drop from lvl 32 Ghastly Growths inside the Dark Glade IZ. -Lightspeed Pants & Dinoboid Frisbee (rare) drop from lvl 32 Bully Behemoths inside the Dark Glade IZ. -Cyber Auto Rifle (rare) drop from lvl 33 Eyebulbs at Hero’s Hollow. -Asgardian Spreader, Ghost Ship Shooter & Short Circuit Pants (rare) drop from lvl 33 Shellwoms at Hero’s Hollow. -Gangreen Gang Little Arturo Jacket, Scorpion Predator, Jade Dragon Blade (rare) drop from lvl 36 Great Shellworms outside Fuse’s lair. -Super Scope Basilisk, Highlander Shirt & Amenhotep Shirt (rare) drop from lvl 36 Scoria Cephalopods outside Fuse’s lair. Dark Apple of Discord, Omega Roughneck & Zanzibar Pants (rare) drop from lvl 36 Meteoric Guardians outside Fuse’s lair. -Wetsuit Sandals, Sentinel Shirt, Sooper, Sticky Gatling Gun (uncommon) drop lvl 13 Dynamite Mouse at City Point. 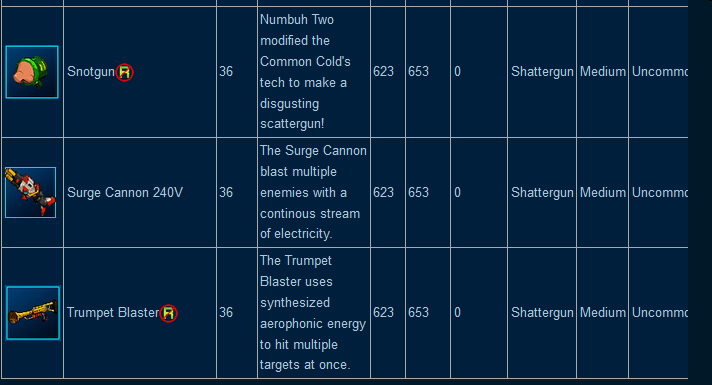 -Hypersonic Drill, Celebrity Rifle, Mommy Thumper, Robotic Claw (uncommon) drop from lvl 13 Fire Hydras at City Point. -Wetsuit Pants, Abstract Vector Gun, San Serif Sword & Stinkray Collector’s Edition (uncommon) drop from lvl 14 Ghastly Growths near Mount Blackhead. -Kamboozooka, Cherry Pop Gun & Guardian Pants (uncommon) drop from lvl 14 Crawdad Daddies at Leaky Lake. -Sooper Sweet Gatling Gum, Wetsuit Shirt, Supersonic Drill, Omega Blacklight Shirt (uncommon) drop from lvl 15 Striding Eels at Leaky Lake. -Tulip Bootie (Girls), Spider Egg, V-Charger Ultimate & Maxed Null Void Pistol (uncommon) drop from lvl 16 Spider Toads and Slime Serpents at Acorn Flats. -Diver Sandals, Guardian Shirt & The John Hancock (uncommon) drop from lvl 16 Terropins at Acorn Flats. Luminous Greatsword, Omega Blacklight Shoes, Stink Ray Ultimate Edition & Carpenter Pants (Boys) (uncommon) drop from lvl 16 Dire Raptors at Townsville Center. -Mecha Pulse Cannon, Vivid Kicks (Boys), Bean Cannon, Deep Tribal Leggings & Diver Shirt (uncommon) drop from lvl 18 Jet Skills at Bravo Beach. Deep Sea Sandals, Beamer Pro, Atmospheric Laser & Steam Shower Spreader (uncommon) drop from lvl 19 Riot Rogues behind the Construction Site IZ at Morbucks Towers. Gator Sneakers, Blueberry Club, Mushroom Blaster, Dagger Illuminator & Fox Tribal Shirt (uncommon) drop from lvl 19 Granite Grabbers at Twisted Forest. Sentry Boots, Hard Boiled Bomb, Optimized Sabre Cannon & Hawk Cockpit Gun (uncommon) drop from level 20 Timber Creepers at the Ruins. -Space Chameleon, Cowpoke Shirt, Red Ripper, & Silver Mace (uncommon) drop from lvl 20 Spawn Simians underneath Mojo’s Volcano. -Bayonet Illuminator, Deep Sea Shirt, Buttoncap Blaster, Road Rash Pants, Bear Tribal Shirt, Jagged Falchion & Blunder Boomer (uncommon) drop from lvl 21 Timber Creepers at Galaxy Gardens. -Suction Laser, Clown Shoes, Star Child Hightops (Girls), Sentry Pants & Beamer Max (uncommon) drop from lvl 21 Demolition Bears & Canyon Stalkers in Devil’s Bluff. -Road Rash Boots, Overclocked Sabre Cannon, Sentry Shirt, Seol Pants (Boys), Neonex Axe & Genie Boots (uncommon) drop from lvl 22 Pneumatic Bears at Devil’s Canyon. -Serrated Falchion, Bodyguard Boots, Teal Filigree Shirt, Ballet Shoes, Pressured Laser, Harmonic Kaya Gun, Coral Reef Diver Pants, Pillow Jacket, Beamer Elite, Candy Cane Shorts & Mega Shield Helmet (uncommon) drop from lvl 23 Putrid Spawns at Steam Alley. Burning Rubber Jacket, Seol Shirt (Boys), Wolf Tribal Shirt, Ski Pants, Blunder Duster, Grapeberry Club, Silver Wing Laser & Seol Shoes (Girls) (uncommon) drop from lvl 23 Oil Orges at Steam Alley. Puffball Blaster, Rabbit Slippers, Caliper Club, Mega Shield Boots, Buckaroo Shirt, Rapier Illuminator, Neonex Shirt & Petrosapien Shard (uncommon) drop from lvl 23 Fowl Fiends at Nowhere. 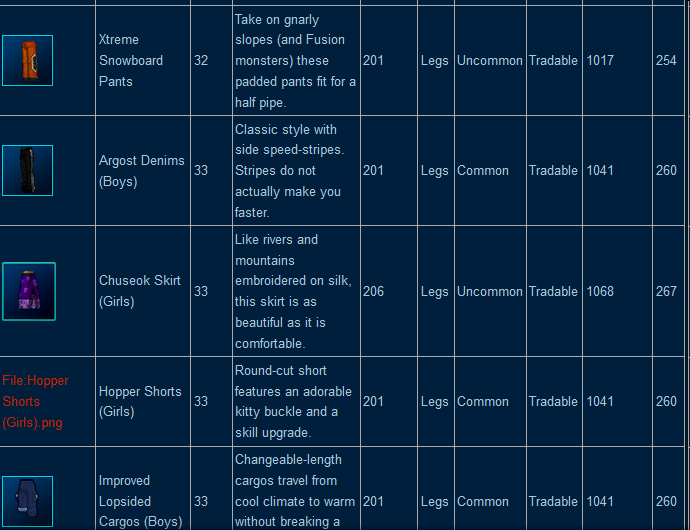 -Jigsaw Shirt, Mediterranean Jeans, Ski Shirt, Buckaroo Pants, Rage Ripper, Lovely Lass Hightops (Girls), Rage Ripper, Seol Shoes (Boys) & Bombastic Kicks (Boys) (uncommon) drop from lvl 24 Ghoul Golems drop outside the Area 51.5 IZ at Nowhere. -B-99 Hornet, Cheese Spreader, Goofy Shoes, Nexonex Shoes, Wolf Tribal Leggings, Diamond Mace, Pinto Cannon, Eagle Cockpit Cannon, Bodyguard Shorts, Seol Skirt (Girls) (uncommon) drop from lvl 24 Desert Clawdad outside the Area 51.5 IZ at Nowhere. Dino Sneakers, Improved Infantry Pants, Argonex Pants, Snowboard Boots, Quantum Laser, Beamer Extremer, Eagle Tribal Shirt, Corn Popper, Plant Club & Hansik Shirt (uncommon) drop from lvl 25 Fowl Fiends at the Lower Catacombs. -Sunken Treasure Pants, Down Jacket, Ocre Filigree Shirt, Rawhide Boots, Hog WIld Handgun, Vulture Cockpit Gun & Royal Mace (uncommon) drop from lvl 26 Cryptworms in the Lower Catacombs. Grizzly Shoes, Goldenberry Club, Mega Shield Shirt, Gladius Illuminator, Argonex Axe, Stinkhorn Blaster, Polar Shoes, Orce Filigree Pants, Sunken Treasure Sandals & Ornamental Cloak (uncommon) drop from lvl 25 Boarbills at the Really Twisted Forest. Ninjutsu Pants, Car Racer Pants, Onyx Falchion, Blunder Crusher, Rawhide Shirt, Bodyguard Shirt, Jester Shoes, Burning Rubber Shoes & Kiva Pants (uncommon) drop from lvl 25 Brackish Beast in the Really Twisted Forest. Grime Serpents have identical drops as well but differ in URs. -Hansik Shirt (Boys), Sunny Side Bomb Space Komodo, Bunny Slippers, I.R. Baboon Shorts, Rad Ripper, Danse Shoes & Garbanzo Cannon (uncommon) drop from lvl 26 Great Terropins at Forgotten Falls. -Ultimate Sabre Cannon, Mecha Pulsa Cannon 5000, Car Racer Shirt, Kiva Boots, Argonex Shirt, Pointed Brush & Snowboard Pants (uncommon) drop from lvl 26 Slizzards at Forgotten Falls. -Piston Rifle, Xtreme Ski Boots, Nautilus Scattergun, King Hammer, Boskov Shoes, Dano Shirt (Girls) & Chaos Gun (uncommon) drop from lvl 28 Fossil Crawlers in Forsaken Valley. -Diskotech 33 RPM, Xtreme Ski Pants, Dano Shoes (Girls), Azure Filigree Shirt, Puffy Jacket, Mustard Acid Blaster, Electroshock Claw & Heavy Kertrunker (uncommon) drop from lvl 29 Lizard Queens at the Firepits. -Rotation Rifle 10x, 3on Cutter, Atlantis Scattergun, Screwball Shoes, Machine Jacket, Laser Lance Mark II, Cyber Shield Boots, Mighty Miss Hightops (Girls), Dano Skirt (Girls) & Dano Shoes (Boys) & Monarch Hammer (uncommon) drop from lvl 30 Miasma Hulks near the Fireswamps IZ. Chuseok Shirt (Girls), Djinn Shoes, Aerial Slicer, Fusebreaker Tornado, Stunt Driver Pants, Micro-Particle Rifle, Xeronex Pants, (Heavier Kerthunker, Xeronex Axe & Hypercharged Claw) (uncommon) drop from lvl 31 Wooly Mammoth and Fusionflies. Chuseok Shoes, 3Con Collider, Oceanus Scattergun, Laser Lance Mark III, Crimson Filigree Shirt, Sultan Hammer, Johnny Bravo Trunks, Comforter Jacket & Rotation Rifle 20x (uncommon) drop from lvl 32 Ghastly Growths inside the Dark Glade IZ. Hoppity Slippers, Chuseok Shirt (Boys), Imperial Trousers, Electric Lancet, Yucky Goomaker, Cyber Shield Shirt, Helixbore Bazooka & Bloo Juice Grenade (uncommon) drop from lvl 32 Bully Behemoths inside the Dark Glade IZ. Surge Cannon 120V, Kenjutsu Shirt, Xenonex Shirt, Stunt Driver Shirt, Xtreme Snowboard Pants, Fast Action Piston Rifle, Calamity Gun & Shooting Star Blade (uncommon) from lvl 32 Dark Fusionflies inside the Dark Glade IZ. -Boot Camp Boots, Doom Laser Sword, Evil Clown Shoes, Xtreme Snowboard Shirt & Alien Acid Blaster (uncommon) drop from lvl 33 Eyebulbs at Hero’s Hollow. -Featherlight Slicer, Crimson Filigree Slippers, Sharpened Dreihander, Triple Threat Fire Boost, UFO Repeater LE, Extreme Jacket, Hyper Shield Boots & Royal Shirt (uncommon) drop from lvl 33 Shellwoms in Hero’s Hollow. -Royal Dreihander, Surgical Slicer, Wind Waster, UFO Repeater SE & Triple Threat Max Boost drop from lvl 35 Slag Cephalopods near the Green Maw IZ. Restest. -Jeongswol Shoes (Boys), Pressurebore Bazooka, Stinky Goomaker, Battlefront Boots, Heavenly Meteor Blade, Electric Dart, Snotgun & Bigtop Shirt (uncommon) drop from lvl 36 Great Shellworms outside Fuse’s lair. -Jeongwol Skirt (Girls), Rotation Rifle 100x, 3Con Crasher, Regalia Shoes, Sawswipe Scimitar, Grapeade Grenade, Poseidon Scattergun, Violet Filigree Slippers, Laser Lance Mark V, Radonex Shoes, Ben Tennyson Tee (uncommon) drop from lvl 36 Scoria Cephalopods outside Fuse’s lair. -Xtra Extreme Shirt, Trumpet Blaster, Radonex Shoes, Drag Racer Shoes, Panda Shoes, Emperor Hammer, Flight Pants, Surge Cannon 240V Cataclysm Gun & Supercow Tee (uncommon) drop from lvl 36 Meteoric Guardians outside Fuse’s lair. Doyle mask (rare) & wooden hat (rare) drop from lvl 13 Destroy-us-alls at City Point. Wizard hat (uncommon) Diving Helmet (uncommon) Billy’s nose (uncommon) & Detective Monocle drop (uncommon), Cyber Goggles (uncommon) from lvl 14 Fire Hydras at City Point. Sombrero (uncommon) Scurvy Day Helmet (uncommon) & Rocket Pack (uncommon) drop from lvl 14 Dynamite Mouse at City Point. Dexter Goggles (uncommon) & Gas Mask (uncommon) drop from lvl 17 Boardwalk Bullies at Orchid Bay. -Bubbles Dynamo Mask (ultra rare) drop from lvl 17 Dynamite Mouse & Wild Skeeters at Pimpleback Mountains. Fred Fredburger mask (uncommon)and Lucky Girl Mask (uncommon) drop from lvl 21 Demolition Bears at Devil’s Bluff. Frog Hat (common), Buckaroo (common), Skull Helmet (uncommon) Ski Mask Goggles (rare) drop from lvl 21 Horror Kings outside the Galaxy Gardens infected Zone. -Mecha Shield Helmet (rare) and Coco hat (ultra rare) drop from lvl 25 Brackish Beasts. -Hammer Hat & Eugune’s Scary Mask drop from lvl 25 Fowl Fiends at the Lower Catacombs. Monkey Helmet (uncommon) drop from lvl 25 Boarbills at Really Twisted Forest. Xtra Xtreme Goggles (uncommon) drop from lvl 33 Shellworms at Hero’s Hollow. I replied to your PM. You now have access to the document. I added a bunch of stuff. We're going to need info on these please.